Description: D&L 405 leads a grain train out of the mill at Pocono Summit. D&L 405 has her paint from Indiana Hi Rail, D&H and Lehigh Valley visible along with her D&L markings. Description: Doing what Alcos do best, this trio makes lots of smoke and noise as the head West back to Scranton with abot 50 cars. 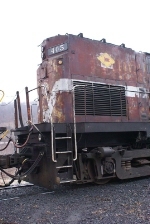 Description: A Delaware-Lackawanna engine sits at the DL's South Scranton Shops. Description: Look closely. Underneath the red and white can be seen the markings of D&H and LV. Title: Heading Through the Water Gap for Slateford Jct. Description: How many rr company names can you find? Description: Lehigh Valley Diamond, D&H Stripes and Indiana High Rail Paint well for the most part. Description: Delaware Lackawanna (Genesse Valley Transportation) locomotives 2045, 2035, and 405 near Steamtown in Scranton. Description: This ex-Lehigh Valley C420 was laying over at the DL South Scranton shop. Note the Lehigh Valley diamond on the back. Description: D L PO-97 approaches the River Road Crossing at restricted speed behind three Alcos. Description: Typical sight when power for PT98 is assembling their train to interchange with NS. Now, if someone could just get that UP Big Boy in the background back in shape to produce this kind of image....! Description: Behind that "cloud" is the tower at Bridge 60. Description: That UP Big Boy is just champing at the bit to make this kind of smoke again someday, don't you think? Description: Eastbound DL interchange to NS. Description: Cruising along the Delaware River, nearing the NS interchange at Slateford. Description: Notch 8 easing past the depot at Cresco headed back to Scranton. Description: Departing Tobyhanna after dropping loads that will head back to Cresco the following day with a grain extra. Description: One of the best spots to shoot the westbounds on the Pocono mainline, there are many angles at Nay Aug Park & this is from the overlook deck. Description: LL1 has come up off the Laurel Line to drop cars for PT98 at Bridge 60. Description: Laurel Line local is backing down past Steamtown for the second trip of the day.